Okay, on to some buttons I've admired this past week. "My husband made my blog buttons for me. I told him basically what I wanted and he created them. 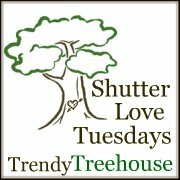 I wanted something simple that tied in to my blog name (the dots) and I wanted it to stand out. Most other buttons for this type of blog are pastels and sometimes seem to have a lot going on in such a small space. 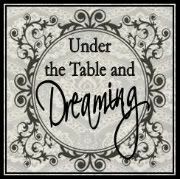 The black and white not only stands out among all of those pastel colors, but it also ties in to my blog name. I've never seen a pastel speckled dog! ha ha!" "We used Adobe Fireworks. The idea was to use something high contrast to make it 'pop' and instead of confining the content to the borders of the image, to allow the circles to play beyond the boundaries, giving a sense of depth. Most buttons seem 'flat and square' so we tried to break that up a bit. The same idea was applied to the @ symbol but to emphasize 'AT the speckled dog' .. i.e. a web destination." I probably like the photo, it's my son in his Halloween costume for his 2nd Halloween when he was 18months old. He's Max from Where the Wild Things Are. Out of all my photos I've posted on my blog, this one has always been a favorite. I wanted to use a photo from my projects, mainly because I don't have graphic design skills to make an original graphic, but I wanted the button to show something I've made and give you a taste of what you'd see if you chose to click on the button. I edited the photo and added the text using the basic Adobe Photoshop Elements. A friend offered to make it a button and emailed me the code to make it available on my sidebar. I like blog buttons that give you an idea of what you would find on the blog, and keep things simple as far as adding a lot of text. And finally, let's take a look at the button for Simple, Sweet Inspiration authored by AJ. I can't put my finger on it, but something about this button caught my eye. Words that come to mind are clean . . .organic . . . fresh. 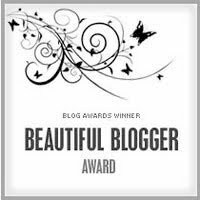 My blog is a mix of mommy blog meets crazy woman blog. I write on themes, memes, post pictures and crafts. I also randomly toss in creative writing in the mix too. I chose the hemp in the basket because it reflects my obsession with hemp... and the earthy feeling of my life. I am down-to-earth, simple and peaceful... hemp feels that way to me. 3) Did you craft your own button or did you commission/inspire someone else to craft it? If you crafted it, what program/software did you use?I did make my own button, header, layout and all. I use two free programs. Primarily I use Paint.net, but also enjoy using GIMP. Both are free online. Thanks to AJ, Kristi and Jessica for sharing a bit about your buttons. Go take a look at the blogs behind the buttons to be even more inspired and . . .
Did you know that you can sew through soda cans? Of course YOU did. I didn't. That's no surprise to you if you are a regular reader . . . by now you know that I seem to know very little about crafty things. 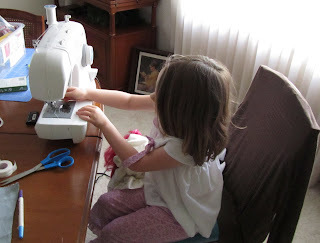 When Fawnda and Jeannine at Fireflies and Jellybeans announced that the very first secret ingredient for the very first Iron Crafter was going to be recycled cans, my brain was full of ideas - impractical and time-consuming ideas. At the same time, my wandering eye for jewelry reared its ugly head. You see, I go through these phases of jewelry lust - not diamond-precious stone-expensive jewelry lust . . . just cheap, mass-produced, poorly made jewelry lust. There is no warning. Nothing to prepare me against these urges. I go to bed one night completely normal. I wake up the next day desiring a bangle, a ring, an anklet - something fun to spice up an old wardrobe. So . . . I decided to pair the Iron Crafter competition with my sudden jewelry lust. And this pairing could not be cheaper, easier or cuter. First, let's work on a bangle or anklet . . . oh . . . just do both. 2) Cut strips of fabric scraps long enough to wrap around the soda can and overlap on the inside. I used various widths of fabric scraps. 3) Loop elastic strip and sew it (yes, with a sewing machine) to one end of the soda can. I went back a forth three or four times to make the elastic loop very secure. I know it looks super ugly, but we're going to cover that up so don't worry about it. 5) Use Modge Podge and paint brush affix fabric to can. With each strip added, paint the Modge Podge directly on the can first, wrap fabric strip around can so that fabric overlaps on the inside/underside the fabric first, and cover strip in Modge Podge. Keep adding strips this way all the way to the other end of the can. Try to line up the inside overlap seam. Don't worry about the white, gluey Modge Podge look. It will dry clear. 6) The last strip added should cover up the elastic ends. Make sure it's wide enough to line up almost exactly with the end of the can. 7) Cut two pieces of double bias tape the same length as each can end. 8) Line the inside of the double bias tape with fabric glue. Place over each end. Cover liberally with Modge Podge. Well, I was planning on showing off the ring tutorial as well, but I'm tired and there's always more blogging to be done tomorrow . . . so that will have to wait. For now, enjoy your new, cheap inexpensive and unique anklet and bangle - a cure for any jewelry lust you've had lately. 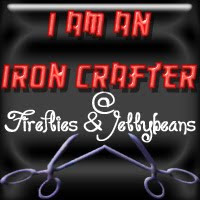 It's not too late to join the Iron Crafter. Look at the tins cans you have in your recycle bin, be inspired and . . .
*I also linked this to Make It Wear It. A few years ago when I sent out birth announcements proclaiming to my 70 closest friends and family members that our second addition had arrived safely into the world, I forgot one very important thing on each super cute announcement . . . stamps. Yeah, did you know that the post office kind of requires those? As you may (or may not) know, I've been working hard on the mail - letters, envelopes, postcards (no-sew & sewing required) - for my eighth craft till Christmas, the pretend and play mail carrier kit. I finished two fabric mailboxes and an assortment of mail. I have also begun work on two mail carrier bags - which I will have a tutorial on soon. But I could not make any more progress on my two bags until this final detail was taken care of for the mail . . . stamps. These are easy and hardly require a tutorial, but well, I'm a little obsessed with tutorials so here is a mini tute. 2) Use pinking shears to cut out little squares or rectangles about the same size as a postage stamp. Don't do this until fabric is completely cool! I learned this the hard way. 3) Cut Velcro into little squares or rectangles that are smaller than the stamps and fuse one side of the pair onto each stamp. Keep the other side for envelopes and postcards. 4) After Velcro/stamp has completely cooled, sew around Velcro to secure in place. This makes the stamp part super secure. As I was playing around with the Velcro on the envelopes and stamps, I found that the Velcro seemed to pull away from the stamp as I took it on and off. It didn't pull away from the envelope though, so I only added the extra security of sewing the Velcro on the stamp. (Wow! That was a super-long explanation for something you could have figured out on your own.) I sewed them all in a row and then cut them apart. A nice tip from a sewing friend that saves time and thread. 5) Fuse other side of Velcro pair to envelopes and postcards. After these cooled, I also went around the edges with super amazing fabric glue to give it a little more security. I let it dry. It dried clear and upheld against me slapping on and ripping off the stamps over and over again. Now I can move on to the mail carrier bags, but not right now . . . long weekend begins now. Woo hoo! I'll be back here on Sunday. Have a great weekend and . . . I took these photos a week ago, and I've been thinking and pondering how I can incorporate them into the twelve crafts till Christmas. Any ideas? This is going to be harder AND easier than I thought. It's going to be harder because there are a ton of buttons out there that inspire me. It's going to be easier because there are a ton of buttons out there that inspire me. Hmmm . . . funny how that works. 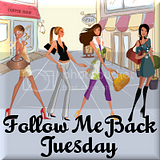 Each week I'm going to feature two to four buttons from various blogs. I don't have any criteria for the buttons I feature. I just have to like them. How's that for strict feature requirements? My husband made my button for me, and I believe he used Adobe photoshop. I think the most important thing about a blog button is that it should be the right size, and be relative to your site. I like the fact that it incorporates my blogs design. The background is the same as my blog as well as the graphic, just a different color. 2) Did you craft it yourself or did you commission/inspire someone else to craft it for you? I made it myself to coordinate with my blog. The last button I'm showing off is one I just happened upon. I haven't actually read Dilly Dally and Flitter . . . yet, but I have plans too because I love the button. I do know that this blog's creator is Michelle and that she has one nifty button. So those are the buttons this week. Go take a look at the blogs behind the buttons if you have a moment. Also, if you happen upon a great button or perhaps you have a button on your blog that you love, please let me know. I would love to have you help me in my search for buttons that inspire.